Bringing you another kate spade new york dress from the Rio De Janeiro collection. All of the prints in this collection are bold and unique, and this one is no exception. I love the oversized geometric print and above all, the way the crepe fabric moves. You can shop the rest of the collection here. Which print is your favorite? Wow wow wow that dress is so amazing! The dress is lovely, I love that you wore a white blouse underneath, I really need to try that with one of my dresses. Interesting print on that dress, love the color combo. Love that print! Definitely perfect for Rio. I love this dress with the white heels. It keeps it so fresh and perfect for Summer! Well done. Very classy and feminine outfit! I love that you wore this dress over a white blouse! 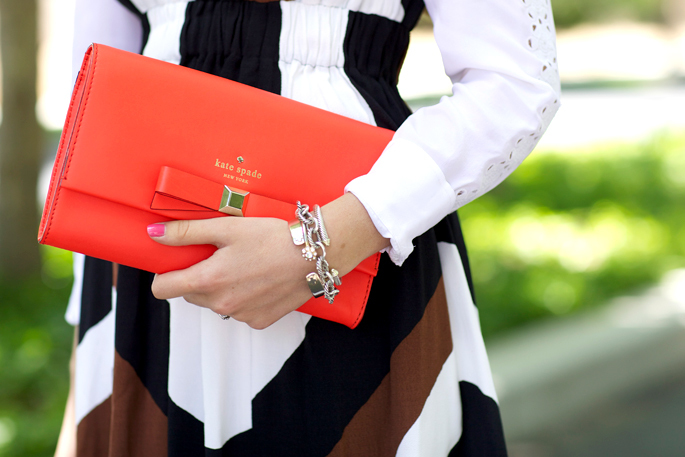 I love that little red clutch! Love the detail on the sleeves of the blouse! Such a lovely look! That dress is so breezy! Love the mix of black and brown as well! This dress is really unique and interesting. I’m not always a fan of brown and black, but this dress pulls it off. Great styling with the pop of color! Awesome dress, love the look. Very cute!! Loving the pop of colour with the clutch! Gorgeous dress. Love the Kate Spade clutch!!!!! ah this dress is gorgeous! love the fabric and the way it seems so swirly and easy to twirl in! Love the detail in the shoes! Loving the delicate details on your sleeve! So pretty. You could provide some much needed styling advice to Duchess Kate. I love this dress, it’s adorable! I love the details of the sleeves of the blouse underneath too! Love the splash of red against the dress! You know, I’m not a big fan of brown at all, but this is a beautiful look! The orange KS clutch is a very unexpected color and I love how you pull it all together by anchoring your look with your white JCs! What a really creative way to style that dress. It makes it totally daytime appropriate and much more casual. Reallllly love this. Unusual color pairing that looks amazing together! Stunning outfit! You look gorgeous, as always! I love this look…this combination is so amazing! I especially love those shoes! lovely! i really like this fabric! I can’t get enough of these shoes! Great dress, I love how you paired it with the die cut blouse. I love the color palette! So interesting! Love your dress! I really like the way you paired a long sleeved shirt underneath! Pretty chic outfit! You look adorable! I am not sure I am in love with this dress but I do like how you paired the clutch and heels with it. You look beautiful as always! Kudos to you and Kate Spade! Perfect shoes! I love how you paired this dress and blouse together! It is just lovely! I love this graphic print. I like the unexpected addition of the blouse with it. I love the pop of red your clutch gives! Love Kate Spade! Sweet dress! Love how you layered it. That lip color is fabulous! WOW so amazing and inspiring! This is an unexpected colour combination for the summer that looks even MORE incredible the way you styled it!! The blouse underneath adds more interest & makes it appropriate for all occasions. Those shoes are the best investment!! They are so striking with the pattern/colours of the dress. Your orange clutch and lipstick brought in the perfect amount of color! Truly great styling!!!! I love the details in this beautiful dress! It looks great on you!! I’m in love with your clutch actually – how cute is it! Love the colors in this outfit, they are perfect on you ! That clutch is too cute!! xo! Yes to the DRESS! I love the black, white, an d brown together! I love the clutch you paired it with too! This is we’ll styled! You look fab! loving those shoes! they are adorable. as is that blouse! Very beautiful dress and I love how you styled it with the blouse underneath. Really really pretty outfit! I love the kate spade purse with that outfit! That dress looks beautiful on you! love the mix of colours. That blouse is just lovely with the cut out details! Gorgeous outfit! Superb dress, can be worn for multiply occasions! I still think my favorite is the tropical print!! You did a post with that dress earlier!! You look beautiful as well! Super cute dress!! You look gorgeous!!!! beautiful look Thank you !